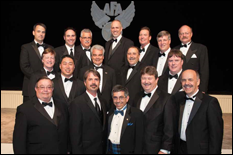 University of Maryland Aerospace Engineering Professor Mark Lewis was part of the Aerojet Rocketdyne Team that has been awarded the Air Force Association’s (AFA) 2013 John R. Alison Award for their work on the X-51A Waverider program. The award is given for the most outstanding contributions by industrial leadership in national defense. Lewis, who is also the Director for the Institute for Defense Analysis’ (IDA) Science and Policy Institute, has been a key leader on the X-51A Waverider program, serving as the Chief Scientist of the U.S. Air Force (USAF) for the program from 2004 until 2008. During that time, Lewis expanded research support and focused efforts on high-speed flight, sustainment, launch vehicle technologies and operational space. His four-year tenure with USAF makes him the longest-serving Chief Scientist in USAF history. The X-51A Waverider (pictured at left under the wing of a U.S. Air Force B-52H Stratofortress) is an unmanned scramjet demonstration aircraft that was the first successful demonstration of sustained, hypersonic flight using air-breathing, high-speed scramjet propulsion. During the final test flight launched on May 1, 2013, the Waverider reached a speed of Mach 5.1 (approximately 3,880 mph) while climbing in altitude, traveled over 230 miles in just over 6 minutes, and was the longest air-breathing hypersonic flight ever. The X-51A program is a collaborative effort of the U.S. Air Force Research Laboratory, the Defense Advanced Research Projects Agency (DARPA), Boeing and Aerojet Rocketdyne. The John R. Alison Award was established in 1992, and is named for U. S. airman John R. Allison (1912-2011), a highly decorated combat ace of World War II, former president of the Air Force Association, and inductee into the Air Commando Hall of Fame who is recognized as a symbol of the "achievements and ideals of the nation's air arm." Read more about the X-51A Waverider's ground-breaking flight. 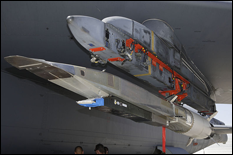 For more information on the X-51A Waverider, visit the program's webpage. Watch the May 1, 2013 test flight of the X-51A Waverider.